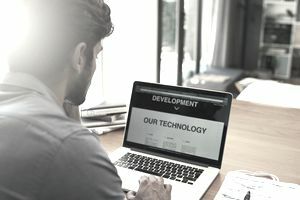 Despite the advances in modern computer technology, there is a common complaint among young and old alike, and that is the dreaded website with text that too small to comfortably read or, worse yet, impossible to read. Especially for the sight impaired it is quite disturbing to see an alarming trend in the number of website pages that open and display text that is too small for the human eye to read, even with the aid of glasses. And this doesn't apply to that age-old dreaded "fine print" you see in disclaimers, terms, and privacy policies. You have come to expect that, especially from businesses that don't want you to know that there's a 20% re-stocking fee should you decide to return those shoes that looked better online. The bigger problem is the actual content, and even sidebar links displayed on websites that you either want to read or need to read. Even some government agencies (including the IRS) have begun to incorporate tiny, unreadable text into their websites. You may find this particularly curious because it is these very federal and state governments that regulate and enforce the Americans with Disabilities Act and advocate for accessibility. But, as the saying goes: "You can't fight City Hall." Instead of fighting City Hall it's best to take matters into your own hands. Unless you are severely vision impaired it is quite easy to enlarge (or reduce) text to make it more readable on your computer screen. The best part is you don't have to spend the time or money to purchase or download special software. The following steps will help you enlarge or reduce the appearance of text on a web page viewed in Firefox or Netscape. Begin by opening the browser window to the page you want to either view in larger text or make the text smaller. To Enlarge Text: Press and hold down the control (Ctrl) key on your keyboard and then press the plus (+) key. Repeat Ctrl + until the text reaches the most comfortable size for you. To Reduce Text Size: Press and hold down the control (Ctrl) key on your keyboard and then press the minus (-) key. Repeat Ctrl - until the text is the desired size to fit your viewing screen. Use the following steps to enlarge or reduce the appearance of text on a web page in Apple Safari. Begin by opening the browser window to the page you want to either view in larger text or make the text smaller. To Enlarge Text: Press and hold down the Apple key on your keyboard and then press the plus (+) key. Keep repeating this process until you can easily and comfortably read all of the text. To Reduce Text Size: Press and hold down the Apple key on your keyboard and then press the minus (-) key. Keep repeating this process until the text is the most viewing size for you and fits within your monitor screen. There is only caveat to fixing this annoying and often troublesome computer situation. You will not be able to do these steps on a mobile device because of the lack of the control tab. However, given the speed at which technology is advancing, it won't be long before this IT issue is resolved.